Most errors in the EasyRotator application have simple solutions. This article covers the most common issues and how to address them. Please see this article to learn about correcting error #2032. If you receive error #2130 when attempting to create or edit a rotator in the WordPress dashboard, please update to the latest version of the plugin (version 1.0.5 or higher) using the Plugins section of your WordPress admin panel. If this problem suddenly started occurring and you're using Chrome on Windows, you may also want to check this issue. 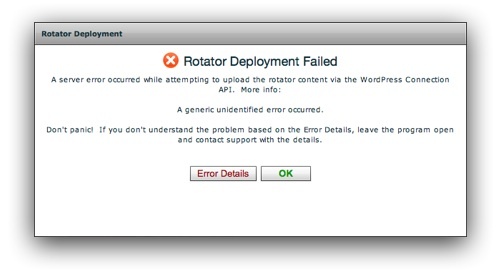 When using EasyRotator for WordPress, you may receive an upload error when attempting to deploy a rotator. There are several possible causes for these errors, so be sure to check each of the following items in order. Are you using GoDaddy for hosting & EasyRotator uploads suddenly stopped working? This issue is due to a recent GoDaddy configuration change. To avoid the problem, select File > Advanced Preferences... in the top-left corner of the editor application before uploading, and set Upload Method to Alternate. Contact us if you still experience trouble after making this change. This error usually occurs if your WordPress site is hosted on an Apache server that has the mod_security module running. Please see this article to learn about correcting error #2038. This error usually relates to having photo files open in other applications. Please see this article to learn about avoiding error #3013. This error usually relates to your PHP memory limit being too low. Please see this article to learn about correcting error #1088. If you receive error #1085 or an error code not listed here, you are most likely experiencing a server configuration issue. Please see this article for instructions on how to proceed. If you're suddenly having trouble with "Please Install Adobe AIR" and "Download Failed" messages in Chrome on Windows, see this article. You should then be able to access the program without any trouble. If you're using the Dreamweaver Extension version and you still receive a warning that says "the wizard is already running," you can safely choose the OK / Continue Anyway option.